What a great way to spend a couple freezing days in January! 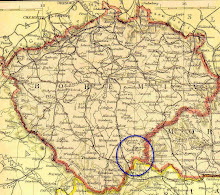 You should recall by now that Grandma Lizzy (Sand Hesch) had an older brother named Joseph, who lived in Saskatchewan, Canada. Joe's wife Antonia was a Poser from Pierz. They were married in Buckman January 14, 1908. Eventually they had a son, Michael, two daughters, Mary and Agnes, and an adopted son, Erwin. Here's a (new) photo of most of them in the late 40s, tho we don't know what the occasion was. I know you're wondering where this photo came from, right? 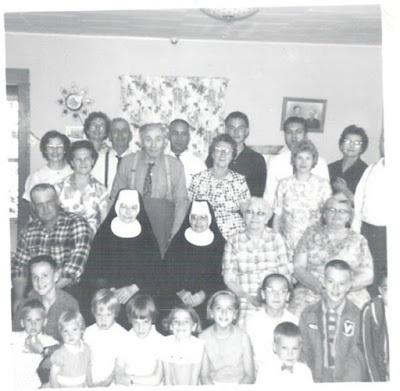 Well, yesterday and today on Facebook we had a genealogical identi-fest, as Christa posted a photo to see if collectively, we could name everybody in the photo. Here's that photo, and yes, we DID! 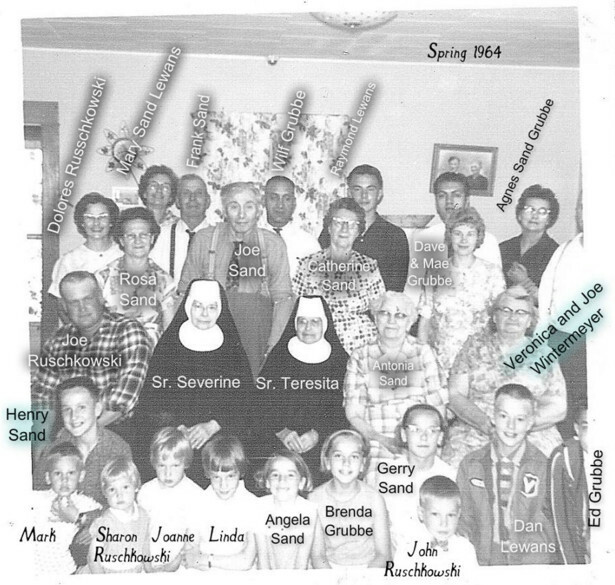 Right behind Sr Severine and Sr Teresita are their two brothers, Frank and Joe (both wearing suspenders ☺), and the woman sitting on the right is Veronica** (Vernie Sand Wintermeyer), so five of the ten sibs were together for a reunion in Shaunavon, Sask. in 1964. 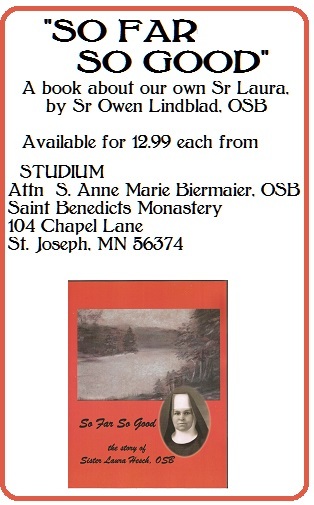 I remember Gramma reluctantly deciding she couldn't go along. I suppose it was partly because the car would have been really over-crowded with Frank driving, Catherine riding shotgun and Gramma, Vernie, and the two nuns packed in the back, tho I would pay to have seen it ☺. 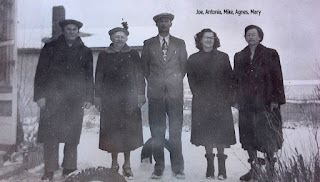 Here's what we came up with: Joe standing and his wife Antonia beside Sr Teresita, Frank's wife Catherine behind Antonia. Mary and Agnes, back row, were Joe's daughters, and Rosa, next to him, was Mike's wife, so maybe the photographer was Mike or Pete. SOME things should stay a mystery, right? **That's Vernie Wintermeyer sitting next to Antonia, but Christa remembered that John Wintermeyer died in 1959, so that couldn't be him next to Vernie. Hooray, Christa, and Thank You! Oh, and Christa, there's a search box, top left, where you can check the whole blog for "Sand" or "Antonia" or Saskatchewan", etc.